This weekend was busy and hectic for both of us. By noon on Sunday, we both wanted to get out for a little while to relax and unwind. We started heading west to go into a part of the city we don’t usually frequent. We weren’t looking for anything in particular, just roaming around, maybe have lunch somewhere. “Hey! Let’s head back and go to that Mexican restaurant we like so much!” Partner/Spouse said. We followed thought with deed, pulled a U-turn, and chugged away. After a few mis-turns, we ended up on the correct street. But we had a choice. There was a restaurant directly across the street and to the left, and the place we were heading for a few blocks to the right. We’ve always liked trying new places so we headed across the street and slightly to the left. We had to wait for a dog to finish crossing the entry to the parking lot first, but made our way to the only vacant spot in the parking lot. We were there walking to the front door of Rigo’s Restaurant Fine Mexican Food. We entered and were immediately hit with the blaring notes of a mariachi band! I almost turned around. We asked the hostess of we could sit outside, but they weren’t set up for outside service. It was a medium-sized place but there was no escaping the live music and I resigned myself to a lunch with no conversation. They have a large menu selection with the standards, but it included some things I’d never heard of. Our waitress was a doll. She was a smiling, happy, mom-type who seemed to take real pleasure in her work. The first thing she said was how much she loved our t-shirts. Partner/Spouse was wearing a Batman logo and I was wearing on that said “Bazinga!” She brought our drink orders which were colas even though they had wine on the menu and I was tempted to have a glass. Next time I will. They also had a full line of beers, domestic and Mexican, as well as the classics, lemonade, tea, horchata, and (oddly) clamato. Go figure. Partner/Spouse ordered a carne asada burrito with a side of rice. I ordered a topopo salad with carne asada. Everyone knows what a topopo salad is now, right? 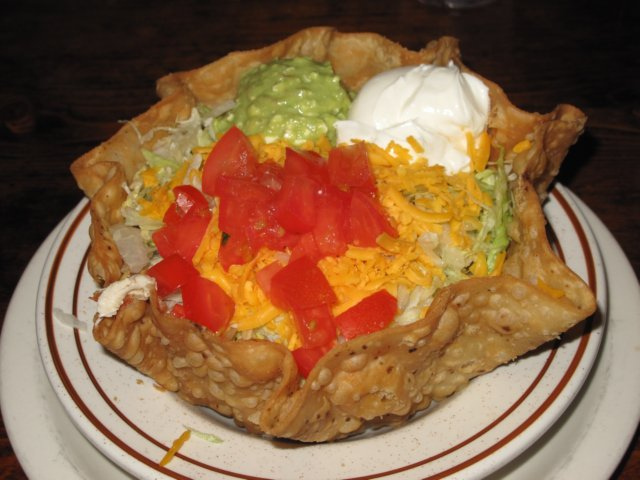 The thing that sets it apart from a regular taco salad is it’s built in layers and the bottom layer is refried beans! Yummy! We ordered a quesadilla as an appetizer. Partner/Spouse asked for a plain quesadilla and our happy friendly waitress suggested green chilies with it. What an amazing flavor! The quesadilla was grilled, crispy, melted cheese throughout, and large enough to feed four people. And cheap! With the chips and salsa and quesadilla, it was way more than enough, and we still had our main meals coming! Through it all, the mariachi band was playing, and people were clapping, and something strange happened. I heard mariachi music that was the best music I’d heard! It was so good I turned in my seat several times to see who was singing! They were great! The harmonies blended perfectly. The voices were perfectly matched. The lead singer was professional quality and could hold a note unwavering and in tune for as long as the song required. If they’d had CDs available, I’d have bought one right then. I was way more than impressed. When our meals arrived, the carne asada burrito was huge. It was a giant flour tortilla stuffed with grilled beef and nothing else. I prefer a burrito that has beans and cheese as a base, and meats thrown in if I feel like it. This isn’t the way Partner/Spouse likes them. So for him, the burrito was perfect; a great big old meat sandwich that he could spoon pico de gallo onto. My salad was a perfect delight. Layered with beans, meat, lettuce, tomato, cheese and topped with scoops of sour cream, guacamole, and fresh pico de gallo. I managed to finish half of it but I wanted to continue. I was familiar with everything on the menu except one item, Calabacitas. Never afraid to ask, the waitress explained that it was a squash like zucchini that they deep fry with a corn meal batter. I didn’t try it, but I am going to have some next time we go. And we are going again. The band stopped playing just before we finished. I was kind of sorry to see them go. They were so good. When I told my sister about them later, she told me that our town holds a world championship mariachi contest every year and even the high school bands are wonderful. Rigo’s has one item on the menu that I’m going to have to try just from the description. It’s called Shrimp Fantasia. It consists of six jumbo shrimps wrapped in bacon and grilled till done. Can’t wait!